We all would love a magic formula that helps improve our traffic and conversions, right? Yes! But, the bitter truth is, however good your marketing material and promotional plans are, you cannot convert leads and customers unless you are proactive and make data work for you. We learned this lesson the hard way when we hosted our first webinar. We spent the first 15 days of our webinar campaign shooting arrows in the dark and ended up having little success. Being a marketer, you should understand what an emotional ordeal it was. All effort and little to show! But fear not – This story has a happy ending. Spoiler: We turned things around and increased our sign ups by 363%! With the year coming to an end, the pressure was on us to convert some of our potential leads. We have never had problems building our email list and traffic. Our only roadblock was conversion and we were already running out of time. We know that if we establish a relationship with the leads and show them how well we can serve them, our leads are more likely to convert. A webinar was an obvious solution to engage potential leads and we were excited to host one named “Is Your Magento Site Ready For The 2016 Holiday Season” to target the holiday season. The timing was perfect, as eCommerce site owners were looking to prepare their online stores for the upcoming season. Our targeted audience was Magento site owners who generate a yearly revenue of over $100,000. This decision was made to intentionally bring down the number of attendees. Remember, our aim was to establish a relationship with our leads, so they would readily convert. But in reality, our plan wasn’t working very well. Our plan was to flood all channels announcing the webinar and see attendees readily sign up. We framed an elaborate marketing plan and were excited to see the signups coming in. After 10 days of running our campaign, we only had 3 people who wanted to attend the webinar. With just 15 days left for the webinar, we had to figure out what went wrong and how to fix it as fast as could! They’re the same marketing techniques we used for all our other successful campaigns. We even had 100+ social shares for our webinar landing page, especially on LinkedIn. We understood that from the marketing standpoint, we were on the right track. But, again, we only had 3 signups. Next, we pulled out our Google Analytics data. We found that we had traffic to our landing page, but not conversions. In fact, people stayed only for a few seconds, barely enough time to see what we had to offer. At that point we knew we had to optimize the landing page, else our campaign was doomed. Thankfully, we had a heatmap installed on all of our landing pages. Now, we could get some key insights on how users perceived the landing page design and content. What the heatmap showed was quite surprising – We realized we shouldn’t really assume how customers will process the information we provide them. Our landing page was clearly the problem and without such informative data we would have never figured it out. We loved our initial landing page design. I mean, what’s not to like, it had all the elements “we thought we needed.” It was well designed, had all the holiday elements and had a clean layout for people to easily understand what we had to offer. But apparently, we were completely wrong about the landing page. The heatmap showed that users never really scrolled down. Users only saw the banner and the sign up form, above the fold. Either they didn’t realize we had content beneath it or they didn’t care, they just left without signing up. As marketers, at times we get arrogant with our choices, as there’s no right or wrong way to do things. The outcome for each campaign solely depends on how well we handle the choices we make. So we thought, if we can convince people to read the content beneath the fold, they will fall in love with us and sign up for our webinar. We reduced the banner size and redesigned the opt in box. We concluded that this would definitely make people read the content, as they could see there’s something else there for them. But then the response was not exactly what we expected. We were successful in making people scroll down, but they weren’t converting. We went from 3 to 11 sign ups, but that was all. Spread over 5 days, it was a small win, but not enough. With hardly 10 more days left for the webinar, we had nothing significant to show for all our efforts. We had to do something else and fast! We brainstormed for over an hour and identified various elements we had missed for a successful landing page conversion. We included the landing page optimization changes to understand how it impacted our campaign. Then, we decided to throw in a generous reward to our participants–A $7,000 worth Conversion Rate Optimization audit for one lucky winner. We also decided to include a link to our free eBook, which has comprehensive tips on eCommerce conversion. This was to help users understand that we are conversion experts and we can help them do their business better. We made all images clickable, as the heatmap showed that people were trying to access them. After the above changes were made, we ran a full-fledged email and social media campaign. To our surprise we had immediate sign-ups. From 11 we were up to 19, on the very same day! We were ecstatic and didn’t want to stop there. We wanted to understand how design influenced users. We put up another landing page and ran A/B testing for both the designs for our “3 days left campaign” mailers. We set up the campaign in such a way that 200+ prospects received our usual design and other 200+ prospects received the new design. The heatmap showed that people were ready to read what we had to offer when we showcased the necessary elements for a successful webinar landing page. Both landing pages fared well, scoring us some 20+ additional sign ups. In our journey from 11 to 40 signups, we understood how valuable customer behavior insight is for our campaign’s success. The Google Analytics report perfectly reflects our landing page optimization techniques for high user engagement and sessions. Provide irresistible offers that makes them WANT to sign up. These conclusions are purely based on data and by understanding how customers perceived our landing page. Overall, this webinar was an incredible learning experience for our team. It was not only about understanding data and tools – It was about not making assumptions and plan for an effective campaign that revolves around conversion. For us, our landing page optimization resulted in an increased number of signups, giving us a whole new perspective about how we do marketing around here. 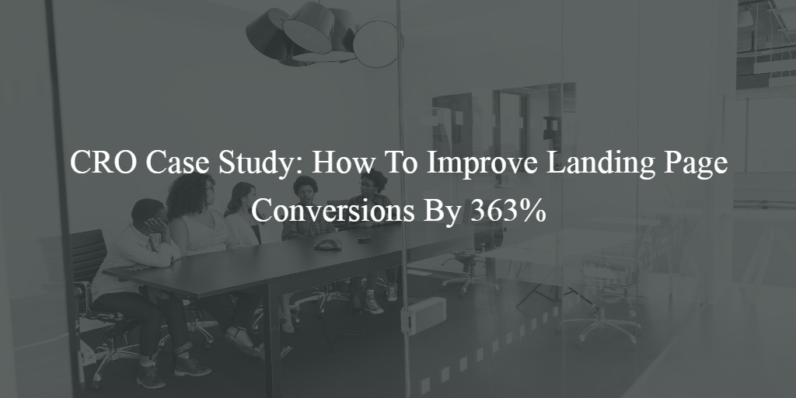 We not only got a 363% increase in our webinar sign ups, we learned so much about understanding customer behavior and how to frame a successful marketing campaign.